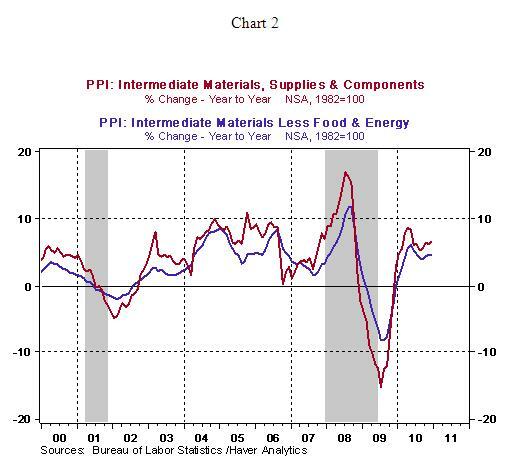 The Producer Price Index (PPI) for Finished Goods rose 1.1% in December after a 0.8% increase in the prior month. According to the Labor Department, about 75% of the increase in finished goods price index was from the 3.7% jump of the energy price index. 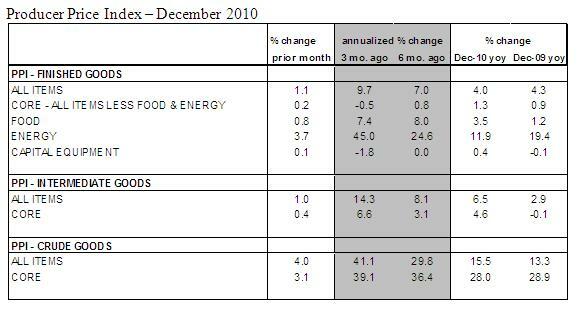 Of the energy items in this index, gasoline prices posted the largest increase. Higher food prices (+0.8%) also made a contribution to the overall wholesale price index, a large part of this increase (75%) is traced to the 22.8% jump in prices of fresh and dry vegetables. In 2010, the wholesale price index has risen 4.0% after a 4.3% jump in 2009 and a nearly 1.0% drop in 2008. 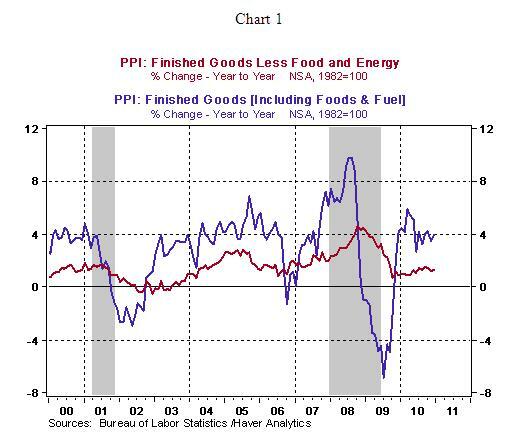 Excluding food and energy, the core PPI of finished goods advanced 0.2% in December following a 0.3% increase in November. In December, a 2.9% increase in cigarette prices accounted for almost 60% of the increase in core PPI. At the earlier stage of production, the core intermediate good price index, which excludes food and energy, has moved up 4.6% in all of 2010 compared with 0.1% drop in 2009. The absence of pricing power, in a soft demand environment, has prevented a pass through of these higher wholesale core intermediate prices to headline prices. The trade deficit narrowed to $38.3 billion in November and is virtually unchanged from the prior month. However, the real trade gap of goods was slightly wider in November compared with the prior month ($45.2 billion vs. $44.8 billion in October). Exports of goods, after adjusting for inflation, edged down 0.8% in November vs. a 3.2% jump in October. Real imports of goods have declined for three straight months, with the 0.1% drop in November being the smallest drop. 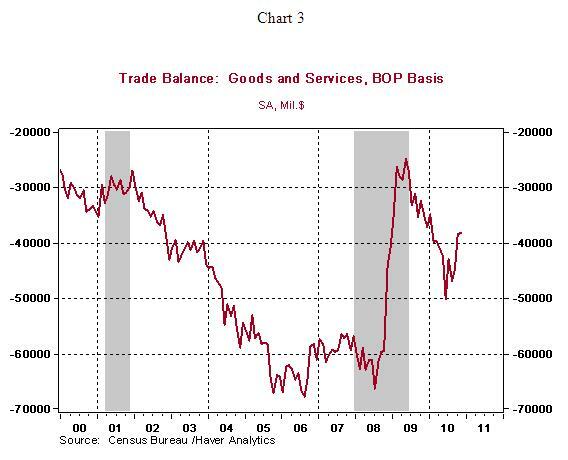 The real trade deficit of goods in the October-November months ($45.0 billion vs. $49.8 billion in third quarter) suggests that the setback from net exports to GDP is less severe compared with the prior quarter. In 2010, exports have posted strong gains in only one out of three months in the first nine months of the year. If this pattern is repeated in the fourth quarter, then exports in December are unlikely to show a noticeable increase. Initial jobless claims increased 35,000 to 445,000 during the week ended January 8. The headline is troubling given that initial jobless claims fell to 391,000 in the week ended December 25 and posted a small gain in the following week taking the level to 410,000. Although these numbers are seasonally adjusted, it appears that backlogs following the holiday season had a role to play in the latest weekly reading. The four-week moving average rose to 416,500 from a low of 411,000 in the prior week, which is a less worrisome gain. 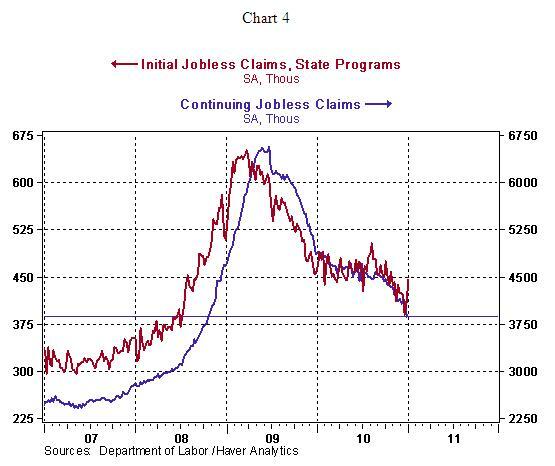 Continuing claims, which lag initial claims by one week, fell 248,000 to 3.879 million, the lowest since November 2008. These mixed messages will be sorted out in the following weeks as holiday-related distortions will be absent.